– http://youalign.com, une solution en ligne d’alignement de documents. Permet de créer des bitextes à partir de vos documents. En format de sortie, vous pouvez choisir un fichier TMX qui peut ensuite être importé dans votre mémoire de traduction. I am relieved to see that the range of texts you translate is varied. There is much talk of specialization, and I whilst I avoid translating documents where I know I cannot deliver quality, I was beginning to feel that the variety of subjects dealt with in last, say, 15 jobs, was making me a traitor to the ideals of our profession. I now realize that versatility – in addition to specialization in a couple of fields – may also be regarded as an advantage! Very true Allison, I agree with you! Some people have a varied life experience and genuinely know vocabulary for a lot of different subject matters, and then there are others (like me) who just really enjoy learning new vocabulary and the constant challenge of a new and interesting topic. The brain is a sponge, and I really believe it’s to your own detriment to focus on the same genre rather than expanding your own knowledge. I really love translation work because you are not only breaking down communication barriers, but also constantly researching and learning new things for your own general knowledge (increasing intelligence!)! Varied translations make for a versatile personality! I am currently studdying a Masters of translation (Fench and English) and an English to french translator. I would like to know if someone could tell me which company could give me work to do at home (as most of you guys do) without meeting this new employer (I have studdies to attend to and therefore can’t travel to other countries for interviews). Well seeing as how there are at least 5 errors in your comment… probably none! Do you outsource? When you list projects that you are working on, does this mean you are working on them personally or you are managing them, perhaps using freelancers to assist you? Hi Erin and thanks for your message. No, I don’t outsource much other than splitting projects with my translation partner. These are all projects that I’ve worked on myself. Allison and Becca, I am not a translator but want to note that specializing or nicheing your business can be a good practice from a marketing standpoint in that it allows you to focus your time, money, and message on marketing your business. Nicheing doesn’t limit the types of work you take on . . . but it does give those looking for your services a great way to remember your name and services . . . . With the ability to “hang your hat” on a particular peg i.e. identify you with a particular specialty, it’s much easier to remember you and to tell others about your work. And, by the way . . . marketing research has shown that if people believe that you are good in one area, they typically assume that you are also skilled in related areas. Corinne, love your blog. It’s chocked full of useful tips . . . even for non-translators! Thanks Tamara, I’m glad you liked the post and thanks for visiting. 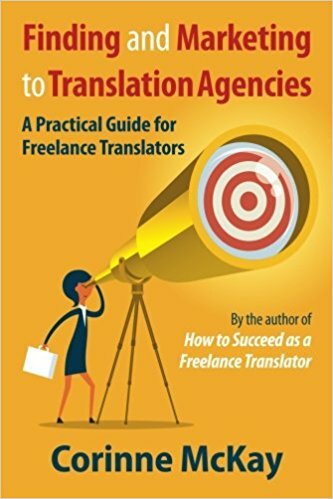 It’s really helpful to have some input from freelancers who aren’t translators (since we translators tend to have a bit of a bunker mentality!!). I am interested in getting ATA Certification in German to English. In order to even apply for ATA Certification, one must take an ATA-approved course in translation even before taking their test. The only course that I found for German to English is at NYU which is rather expensive. Are there any less expensive alternatives to the NYU course here in the States? I do have an extensive background in German, having lived and worked in Germany for a number of years as an opera singer. There are so much documents for translation in a company, and their documents are to be translated generally to the other language, But the main problem is the pricing for translating the document, so i think your are the one of the affordable translation service provider! Thanks for providing your service! I wouldn’t dare to call my self as a translator, but there is something that interests me in it. Thanks very much for your comment! I will put it in the queue for my “Reader Questions” series! Hi, Corinne! I’ve been away from your blog for too long. Hey I’m curious about your list in this post. Do you continually update it or was it just a snapshot of one point in time? I’m taking inspiration from you and thinking about doing something similar. Hi Tamara and thanks for your message. I update this list on an ongoing basis, because I find that otherwise I forget what I’ve worked on. Then when a prospective client asks “Have you translated anything related to vaccination funding/land ownership in Africa/marketing materials/etc.,” I struggle to come up with an answer! But definitely feel free to borrow the idea for your website! Greetings from an expatriate Indian living in Italy. I am an architect by training, bi-lingual in Hindi and English and near native in Italian. My day-job is with an engineering company in the Oil & gas industry, while I do translations from Italian to Hindi/English (mostly Hindi). Demand not being very consistent in this language pair, this activity for me is only on part-time and freelance basis. However now it is 5 years that I am doing this activity. I would like to grow in the field not only because it gives gives me a sense of freedom (my dream is to be a job creator) and helps me not loose grasp on my mothertongue Hindi – where I live I am possibly the only person that speaks that particular idiom – but also in order to ‘see’ and live a more connected world. Any suggestions to increase work flow, gain more clients in the Italian-English pair and most of all handle the resulting work flow? I could only dream (admittedly you have much more experience and the language pair is much more sought for by companies) of a work flow like yours’ – very daunting indeed – however if you could share your views on providers who technically do not Translation related education but do fill in gaps which do exist (not many Italian-Hindi translators are to be found) I would appreciate it a lot. Hello Ashish and thank you for your message. If you search the archives of my blog, you’ll find lots of marketing-related posts. I would also recommend reading non-translation blogs such as The Freelancery, Duct Tape Marketing, etc. to get some ideas. Best of luck with your work!! I specialise in one field only, legal. There are just not enough hours in the working day to keep abreast of the work, much of which is quite complex. I would be unable to take the time to research other subject matters, for example, medical, or tourism, or sport etc. . I simply do not know enough about any of these fields. So, if one of my clients requires a translation which is outside my area of expertise I send the work to a translator colleague specialising in that area. It saves time and ensures the client is provided with a perfect translation. I have been in the business for twenty-seven years. The majority of my (direct) clients have been referred to me by word of mouth. Where is a good place to look for translation opportunities in international development? What is the best way to reach out to such organizations? Hi, sorry to leave a slightly unrelated post on here but there is a reason I promise! I’m a teacher of English as a Foreign Language and we’re currently studying translations and translators. My students were hoping you could answer a couple of questions. We’d be really grateful if you, or anyone else on here could reply. 1. Do you translate texts word-by-word or is it more by phrase and context? 2. How long on average does it take to translate a page and/or a book? 3. Do you usually cast your net pretty wide, in terms of resources, when trying to translate awkward phrases or sections of a text? 1. No, we professional translators DO NOT translate a text Word by Word, we have to read the whole passage/text/book first, and then we start working by sentence, paragraph, getting the idea, etc. 2. the time spent in translating a page or passage, or book DEPENDS entirely on how difficult that passage, page, technical or not IS. There is no fixed time in the translation of a page unless you are taking a translation exam! 3. being a translator is AN ART, you have to study mínimum a 4 year university course, have a good background in your language pair, near native, and a good general culture of that languages.